You are here: Home › How To › User Profile Migration to new PC, new Domain, new OS - keeping all settings, data and even apps. User Profile Migration to new PC, new Domain, new OS - keeping all settings, data and even apps. Learn how to automate User Profile Migration, whether it is performed in same domain, to a new domain, local to domain, to new workstations or new OS. Need to migrate some domain profiles, and would rather be doing anything but that? In this tutorial, we'll present a way to automate this whole process, and do profile migration efficiently, and completely (so that you don't have users complaining about missing data or personalization). In addition to profiles and files, you will also be able to copy applications and their settings, should you decide to transfer those as well. The simplest (and most common) user profile migration case is transferring Windows user profile from one computer to another, usually as part of a regular workstation refresh cycle. This can be handled in multiple ways, depending on your requirements and existing toolset. If the profiles are centrally managed / roaming profiles are implemented, and if you only need to transfer user data and basic personalziation, all you need to do is add the new PC to the domain, log in and wait for the sync to complete. In other situations, such as when workstations are not handled centrally, when roaming profiles are not available, or when you simply require a complete migration with the end result being as faithful as possible to the user's original system, profile migration can be achieved using Zinstall Migration Kit Pro. It is able to transfer profiles, data, accounts, settings, applications, and pretty much everything that makes the user's system his home. It also ensures that the transfer is complete, and no user files have been missed in the process. Join the target machine to the domain, and log in as the same user on both machines. It does not matter which user, just make sure it is the same on both. All users will be migrated in one migration pass, even if you have hundreds of them - you don't need to do this for every single one. Note: You can get the Kit here, and its user guide here. Note that you can also use the Kit in a command-line mode, which is useful in SCCM and other management tools integration. See "Command Line Execution" in the user guide. That's it! The profile contents are transferred to the other workstation - and the migration is complete. When the goal is to move users to a new domain, the main issue is that old domain SIDs are not recognized by the new domain. This means that even if you have a way to copy the profiles over, they still won't be accessible on the new domain. The good news is that Zinstall Migration Kit Pro can automate most of such cross-domain migration (although not all of it). Using the product, you will be able to migrate user profiles from one domain to another, and still keep user files, settings and even applications intact. The caveat in a cross-domain transfer is that you will not only need to join the target to the new domain, but also log in as the specific user you are transferring, in each domain. See instructions below. This process does not disrupt the profile SIDs, and transfers settings in a way that is identical to a human operator manually transferring data and reconfiguring settings (although, unlike a human, it covers everything, and does not have to be "familiar" with a specific application in order to transfer its settings or even the application itself). This part also ensures that the new domain is not "trashed" with remnants of the old one. The transfer works in a similar way as the regular migration instructions. The only difference is that you have to login as the original, old domain user (OLD-DOMAIN\USER) on the source machine, and as the replacement, new domain user (NEW-DOMAIN\USER) on the target machine. For more detailed instructions, see profile migration to different domain. It also works even when you are switching to a new domain on the space PC. See instructions below, or a more detailed guide on in-place switch to a new domain. The environment is a tangled mess of unmanaged, standalone workstations with local user accounts, and you have been chosen to untangle it and build a proper managed domain environment? That's not going to be easy, but at least you can migrate the profiles without too much effort. Migration Kit Pro can migrate local user profiles to domain profiles in the same way as cross-domain migration above. Login as the local user on source, login as the domain user on target, and perform the migration (it also works in-place). See more details in local to domain migration guide. Take the headache out of user profile migration. 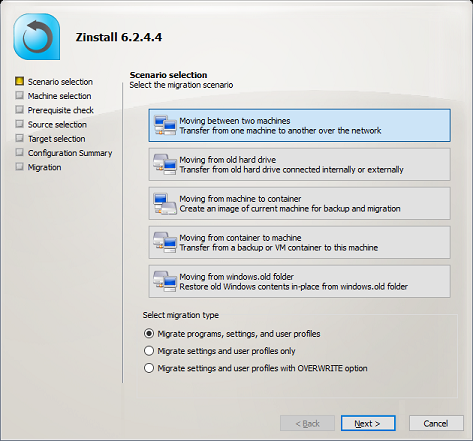 Get Zinstall Migration Kit Pro here (or contact us for more info and volume discounts).